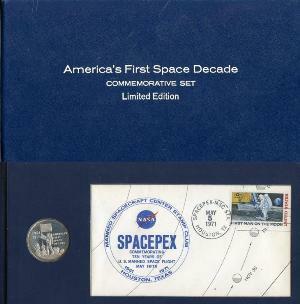 1971 America's First Space Decade Commemorative Set, Limited Edition. Danbury Mint - Postal Commemorative Society. Home > Tokens and Medals > 1971 America's First Space Decade Commemorative Set, Limited Edition. Danbury Mint - Postal Commemorative Society. The set includes a First Day Cover and solid Sterling Silver Proof Medal. Housed in a blue display folder.